I love 'em! Now my snowball-fighting kids look like they're actually having a snowball fight, instead of just standing there sort of showing their snowballs to each other! Please come out with more colors soon! We are planning on a new photo shoot next month for the articulated miniature legs next month as well to put all the comments you have made here to model these off. I love it. Those last pictures are super! I like the look of that dwarf with the grey beard. Is that Gandalf's? 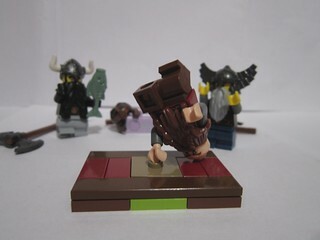 I guess I sort of can see what they are saying but I always felt the minilegs looked a bit delicate for dwarves. We are planning to for certain but need to wait some to recoup some of our initial costs before we can start run two. That said we have had basically daily sales the two weeks we have been doing this so we'll get there and thank you all for your interest in them. We really made these for you all and are happy they are working. We are likely going to do a poll to decide what colors are high on the wish list and will go from there. I will post it here for you all to have a voice in what you'd like. Gimli looks as though he's enjoying himself. We lowered the price of single units to 1.15 each as a standard price. 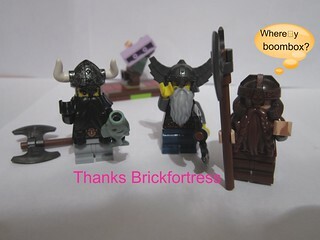 Just a heads up that I posted a review of your mini-legs on The Brothers Brick this morning. I hope it helps get the word out about them, they are awesome! Looking forward to the poll. Maybe allow for people to choose more than one color so you can gauge better what is the second most wanted. I received a PM on another forum asking me about the legs and directed them to this thread. Going to re-post one of my photos on Flickr, so hope that helps too. Thanks to you all for getting the word out! Thank you very much looks excellent and thank you for the kind words. Thanks for the help in letting people know we are here. We might try and make some Lego Conventions in the future depending on our schedules to get the word out. I think we will likely ask for a call out of all desired colors and then do a poll. I will certainly be keeping a list of them as we plan on making these for some time so even if we do not get to it right away we can have a list of colors for the future runs. Hey we are on Facebook now! We will likely put some thread up here and on FB for colors people would like then start the poll so check in when you can! Also we would like to make sure all who want these for the holidays can get them so order early! I'd hate for people to have to sit around standing during all your holiday themed MOCs. Thanks for all your orders and interest all! Hey ladies and gents we are having a 12-12-12 sale!!! ^ Saw it on FB. Placed my first order. Looking forward to seeing the product. Oh good! I am glad you saw it. For all here you need to go to FB for details. If you do not have FB shoot me a pm. Man, these look great! Even though I'm into Elves a bit more, I'll probably have to get myself some of these sometime soon! Keep up the good work man!